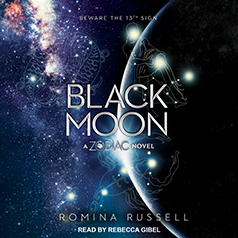 Romina Russell presents Book 3 in the Zodiac series. One final secret stands between Rho and the enemy. But will the devastating truth destroy her first? When news of a stylish new political party supported by her best friend, Nishi, sends Rho on another journey across the Galaxy, she uses it as an opportunity to hunt the hidden master and seek out information about her mother. And what she uncovers sheds light on the truth—but casts darkness upon the entire Zodiac world.